Do you want to add a unique water feature to your Santa Monica landscape design? Busch Design Build, Inc. specializes in adding green elements to your backyard that will make your space look and feel more appealing. 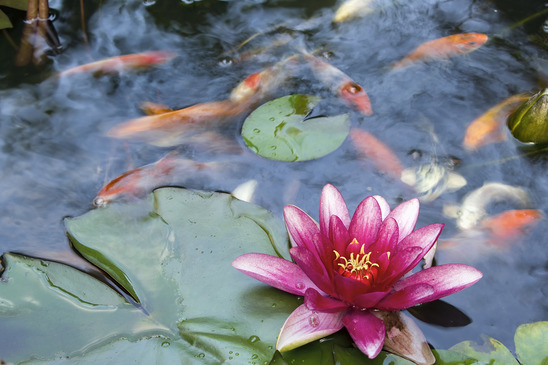 A koi pond is an excellent choice for your Santa Monica backyard remodel. As the name suggests, a koi pond is used to hold Japanese Ornamental Carp fish, or koi. These fish come in many different colors, and will be a great water feature for your outdoor space. Your local Malibu construction company will give you details about building the perfect koi pond in Santa Monica. You can’t just dig a hole with water and put koi in it, they will not survive. Try placing a garden hose or a rope as an outline of where you want to put your koi pond, and then taking the time to view it from many angles. You want to pick the perfect location for your koi pond so you can enjoy it not only when you are outside, but, possibly, even when you are inside. Try to pick a location that is most viewable from different rooms in your house. You may even want to consider putting in French doors or bigger windows in some rooms so that your Santa Monica koi pond will be visible from there. SF Gate recommends that you try to find a spot that has some shade, and is not in direct sunlight. This can be tricky because often shade is provided by trees, which you do not want, as trees will drop leaves in your koi pond. If you don’t have a good shady spot, add water lilies to the pond so they can provide shade for the fish. The ideal dimensions of your koi pond are four feet deep and 13 feet wide. In this space, you can fit about 15-20 fish in your Santa Monica koi pond. This will give the fish enough room to grow and flourish. You also need to have six inches of space between the water and the edges of the pond so that the fish don’t jump out or to get outside rainwater or plants into the pond. Investing in starting your koi pond can be costly, but it is imperative to purchase reliable equipment to keep the koi fish healthy and happy. You will need a good bottom drain to feed water to the filtration system. Tom’s Koi explains why continuously feeding water is important. The site also states that it’s imperative to purchase a good filtration system to keep koi and the pond clean. The system needs to have four things: one or more bottom drain(s), depending on the size of your pond; settling chambers, which are basically a whirlpool to get large-sized debris out of the pond; mechanical filtration, which consists of brushes that will stop debris from entering the water, and; biological processing, which is good bacteria that you need to introduce to your Santa Monica koi pond to keep the bad bacteria to a minimum. “A filtration system that includes an ultraviolet sterilizer and a protein skimmer will keep the pond water clean for you fish. They will also keep the water free of algae and other microorganisms so that it stays clear enough for you to see the fish,” according to the SF Gate.